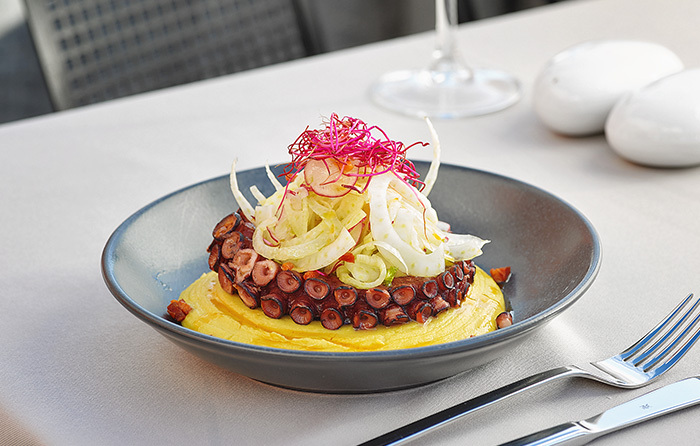 Welcoming you in Santorini’s paradisiac eastern half, away from the tourist-clogged western spots, Mr. E invites you to taste the island’s famed gastronomic legacy led by Noma alum Alexandros Tsiotinis. Within ISTORIA, Santorini’s newest seaside hotel in Perivolos beach, Mr. E serves up modern Greek and Mediterranean fare, in the outdoor patio that is embraced by a verdant natural environment of ancient olive trees, herbs and aloe, just a few steps from the midnight blue waters of the surrounding Aegean sea. The calmness of the relaxing surroundings, the wealth of subtle pleasures and diversions, from the magnificent wines of Santorini to the food prepared by Chef Alexandros Tsiotinis, lets every dish at Mr. E tell a story. Just a bite and you can understand the story of its ingredients, the story of the freshly caught fish, of the hands that picked the locally sourced vegetables and prepared the food, combining the different textures and tastes to create the perfect balance in every plate. As Mr. E’s guest, you will not only savor the tastes, but also the hospitality and sharing, ingredients of equal importance in Greece, as much as the food itself in this unique culinary journey. Carefully selected ingredients meet the inspiration and creativity of Mr. E’s chefs in an inspired menu that will take you on an epicurean adventure to the tastes and flavors of Greece and the Mediterranean. Enjoy fresh fish and seafood, classic recipes with a contemporary twist, colorful salads and meat dishes that are made to pair perfectly with wines from Santorini, Greece and the world. The refreshing sea breeze, the delectable dishes and Mr. E’s graceful summer mood tempt and please even the most discerning food lovers. Dining at Mr. E is more than a luscious indulgence; it is the wondrous feeling of being in Santorini, of becoming one with the eternal beauty of the sea and the irresistible allure of this volcanic land, as you enjoy the best of its epicurean legacy. Bite by bite and sip by sip, in Mr. E' s menu you will find innovative combinations of great ingredients, textures and flavors. Get ready to enjoy a sublime gastronomic experience! Mr. E is located in the black sand beach of Perivolos in Santorini, within Istoria, A Member of Design Hotels. With a relaxing, yet elegant ambiance, Mr. E is the ideal backdrop for romantic dinners or special times with friends and loved ones. Right on the seafront, the location is distinct, private and it will surely become the highlight of your vacation in Santorini! Mr. E Restaurant opens daily from 9am to 12 midnight. Please contact us for reservations and any information needed.